Andre just gave one to Martha Stewart and Tyra wore one on the newest episode of America's Next Top Model. I cannot wait to make this~! So cute!!! Check out these fab bloggers posts this week! This week’s roundup of top style bloggers is all about pieces that are used to complete the style puzzle….from nailing the right color to accessorizing correctly to pregnant yet poised style, and getting the gentlemen ready for the launch of Net-a-Porter’s men’s site. Mr. Porter. Reading the host of articles this week should you leave ready for style no matter what you wear or what phase of life you’re in! The LOFT has connected with ELLE magazine to bring an event like no other, and I will be tuning in! LOFT Senior Stylist, Lisa Bradkin will be on hand to answer all of your pant style questions. Plus, they will be giving everyone who logs in an exclusive discount code to use online and in LOFT stores! I can't wait to use that! :) You can start submitting questions on the Facebook page here. Why: To learn about how to style your pants for any occasion and for every shape. Here is more information about the stylist, Mandi Line. She's also styled shows like: Greek, Cookers, The Crow, and Humble Pie. I just received a thank you card and fab gift from Lucky magazine for being an alpha shopper! They have such an amazing program! I'm excited to see what they have in store!! The silk dresses are inspiration for how I will style my Grey Ant dress that I bought at Buffalo Exchange. Stay tuned to see how I style the dress! I spotted this bracelet today and the swap party that I went to and I had to have it! I, of course also had to share it with everyone. The fashion friend that shared the info said she had seen it on The Sartorialist...fyi, if you want to check it out. She found two different options. The prices aren't that BIG...but, there are a few dollars to save if you can wait. Sadly, the budget friendly is out of stock right now...but, if you can't wait...it's worth it! How are you going to rock this? I'm loving how the fashionista on The Sartorialist layered it with other not so expected bracelets. I spotted a crop top at American Eagle Outfitters yesterday (sadly, I couldn't find it online yet) and I kept myself from buying it because I wasn't sure if it was "appropriate" for a mommy. But, when I got home I had received the Free People catalog and was so inspired and decided I could still rock one. This cropped tank looks more like a bralette or a bustier maybe...but, I still love the idea. It reminds me of the 50's. So here are a couple of ideas for how to style a crop top. 1. 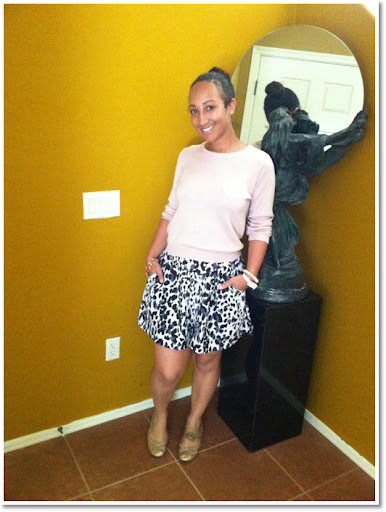 High waisted skirt: I have a few of these and LOVE them! I usually wear them with tops tucked in. But, I thought this style skirt would be perfect for a crop top. Skin will barely show where the fabrics meet. 2. The long tank: I saw this in the Free People catalog and they did a lot of layering...but, I thought you could keep it simple and just add the long tank for coverage, but still have the focus on the cropped top. 3. The maxi dress: I think that this would be genius! I am all about the maxi dress and this is a great way to make the look a little more dramatic. 4. The high waisted pants: You could do this with high waisted jeans, but I thought it would be a little more funky with this style pant. The belt adds the drama too. This week we have lots of great stuff and, yes, most is about Mercedes-Benz Fashion Week (NYFW). But we also have a fab product giveaway from Closet of Style, a glimpse of the latestspring trend of mid-length skirts from Fashionalities, the resurgence of handbag designer Jacques Fath, and, of course, terrific reviews of some fabulous NYFW 2011 shows includingBetsey Johnson who used her store employees on the runway!! As always, the articles are insightful and, chock full of great information and stylish tidbits. A lot more to come! The prices are great and the KMart spring style is perfection! I can't wait to see what's in the store too! I'm thinking I will do this shopping challenge like Lucky magazines March issue, 90 Days of Outfits: A genius styling guide to dressing for $5 a day. Ok...some are NEW and some are sites I just found:) ENJOY! I LOVE anything DIY so when I read about this in the February issue of InStyle magazine I had to share! I now have a list of projects I want to create for this spring! She not only comes up with fab DIY projects, but also shares projects she finds on other blogs. GENIUS! I love this site for street style...so much inspiration! The BEST vintage inspiration ever! I'm in LOVE! Coming Soon! I can't wait! If you follow them on Tumblr you'll see why. Get into the head of Jenna Burke from Lucky Magazine and see what she is thinking. Do you have any favorite new fashion sites?? My love affair with Payless continues...I want EVERYTHING here! Great tips! Be inspired to have fun with your wardrobe! Meet the midi: Mid Length skirt and heel-Which is your fave? After seeing the email from Saks Fifth Avenue sharing their top items for spring and seeing the midi heel made the cut. I had to share some of my favorite looks from skirts to shoes when they meet the new length. Join Boutiques.com for NYFW fun!! !